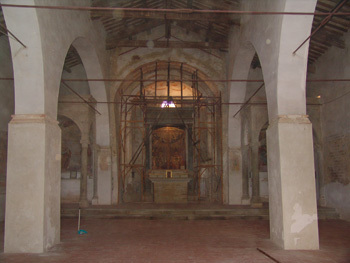 Around 1100, according to archive documents, Pieve San Gregorio already existed outside the walls leading to Carpini; this village is also associated with the name of St. John the Baptist. The inhabitants of the village celebrated this saint as a celestial protector of the Comune with a great feast. 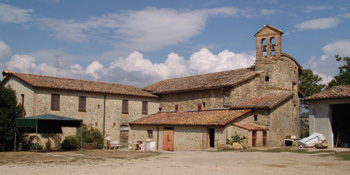 Since 1207, as listed in the papal bull by Honorius II, Pieve di Montone had its own hospital for travellers and pilgrims: it is in Romanesque-Byzantine style with three naisles and it was partially transformed by Cardinal Vitelli when he was Lord of Montone. Each of the two aisles ends with a niche built in “pietra serena” stone and sustained by well-made columns which were probably taken from the church of St. Francis and reassembled here incorrectly, as it is shown in the Museum’s catalogue. The front arch is Romanesque, whereas the two lateral are lancets. The nave ends with a round apse that surrounds the altar. On the altar there is still a great XIII century gilded wooden sideboard with finely crafted doors; inside this sideboard was preserved a wonderful “wood group”, an excellent and authentic example of the XIII century sculpture which is now exhibited in the City Museum. Inside the left niche a representation of SS. Annunziata is preserved and inside the right one there is a Virgin with Child. Along the walls there are frescos with incomprehensible motives which overlap in more parts. In 1935, a Holy Trinity and a “Virgin nursing the Child” were brought to light which are propriety of the Diocesan Curia.